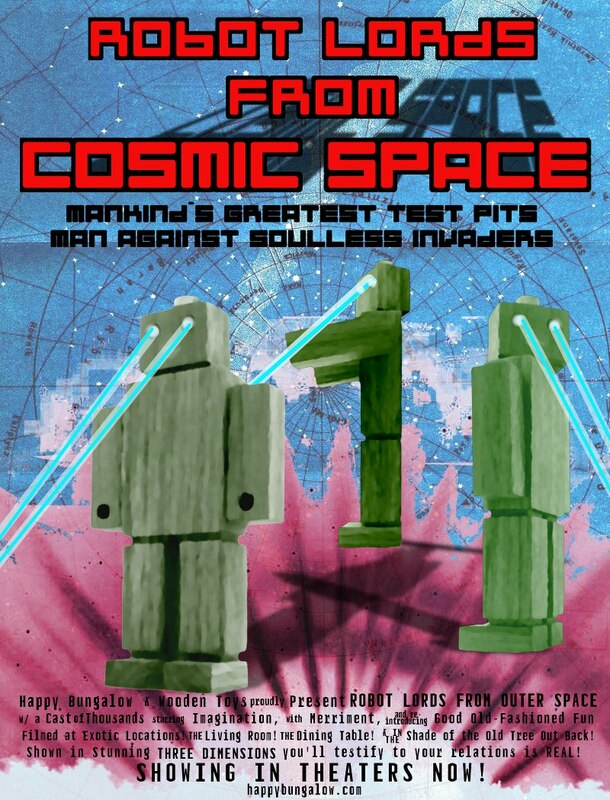 “Vintage” movie poster: Robot Lords from Cosmic Space. Looks nice, and maybe passably real at a glance. Though we made this one up ourselves. 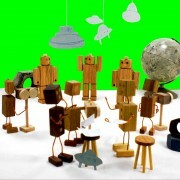 The robots in the poster are renderings of our own wooden robot toys available for purchase in our online toy shop. Pick one up and make some fun of your own. 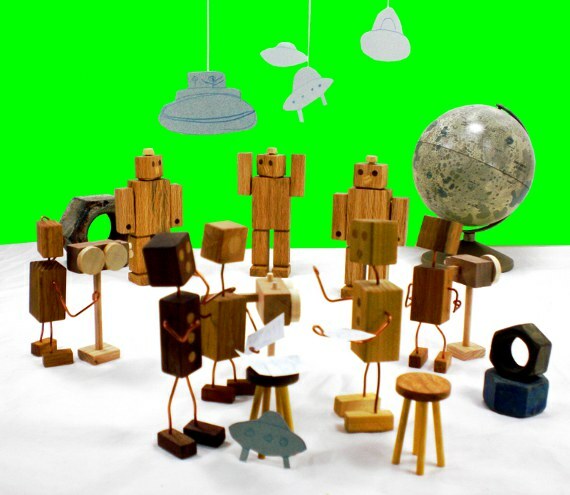 All of Happy Bungalow’s wood robot dogs come fully housebroken. In addition they respond astronomically well to the STAY command. 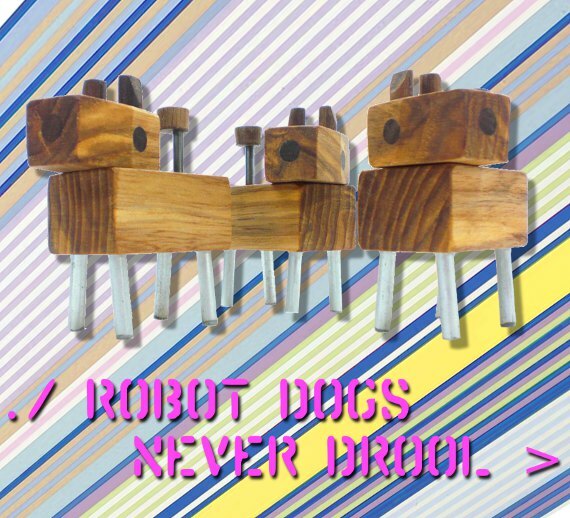 Adopt your robot dog today. A sort of promotional item we’ve put together a robot comic art poster. Featuring your favorite Stobor robotS rocketed-powered robot, the 413-RE (popularly known as Rocket Rob). 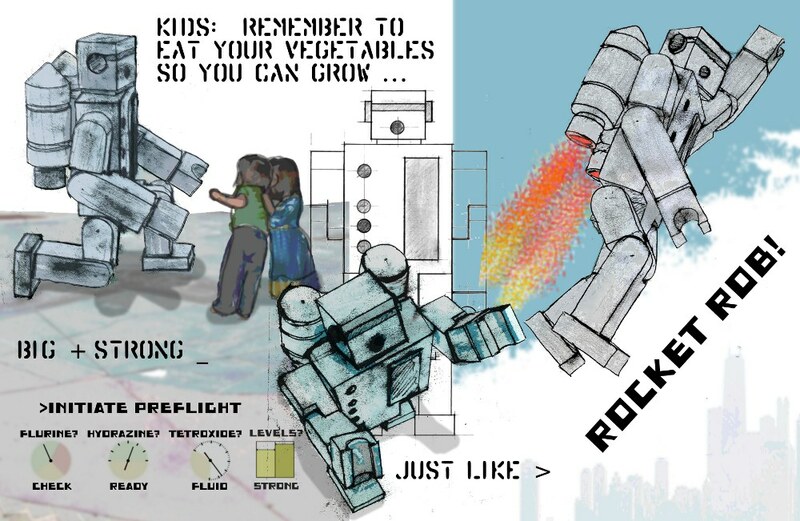 Read more about Rocket Rob here. 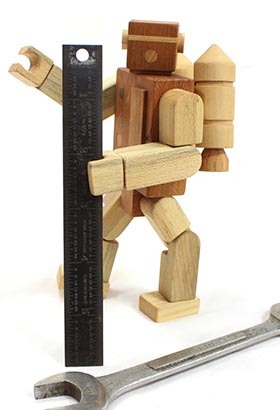 Of course the comic is based on our wildly popular wooden robot toy Rocket Rob. 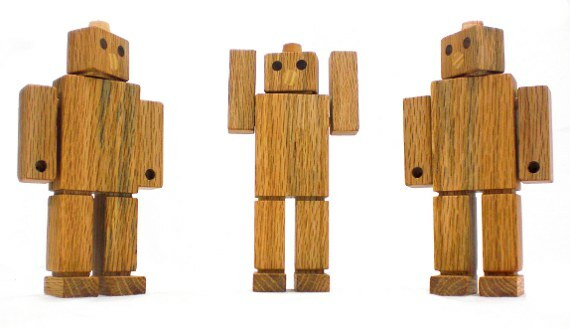 Check out all of our wooden robots in our shop. The Model 80 was developed by QreXion Inc. Utilizing revolutionary actuator systems, staggered limb jointings, and slim-line power systems, the robot was able to lift and carry extreme loads over long distances. Unfortunately QreXion was as deficient in accounting aptitude as it was rich in engineering skill and the company fell into financial troubles before it could turn the Model 80 into a production robot. 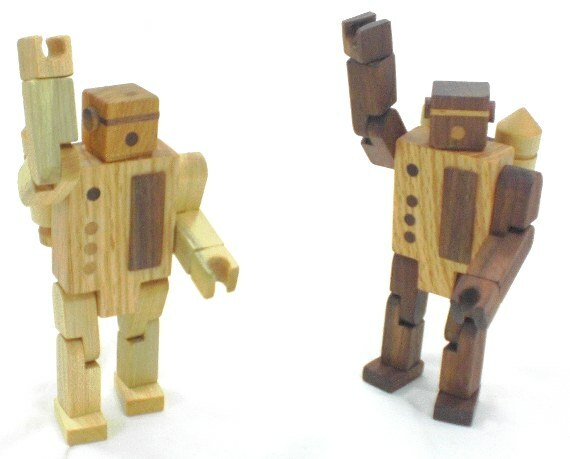 QreXion was later acquired by Stobor robotS. Stobor retained the prototype Model 80 name (the quirky company preferred robots with whimsical names). 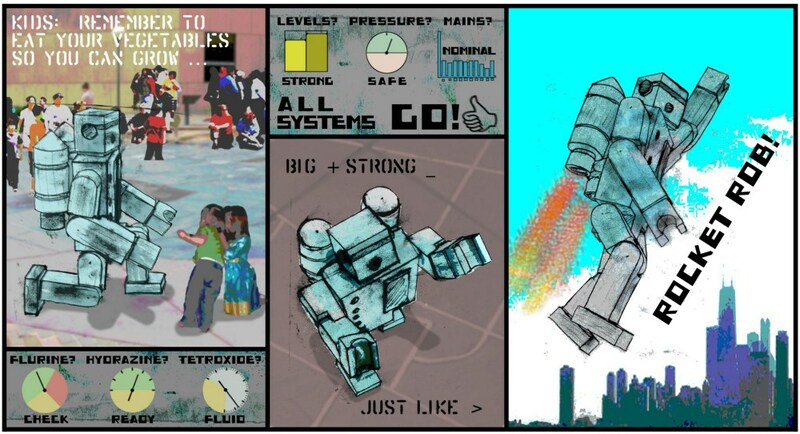 Nicknamed “Heavy Lifting Hal”, the robot was sold to the industrial facilities around the globe. Firmware upgrades later made the robot autonomous, eliminating the need for human supervisors. Fun Fact: A tremendous success, “Hal” is credited with the obsolescence of the forklift. https://happybungalow.com/wp-content/uploads/2015/07/Happy-Bungalow-wp-logo2.png 0 0 Don https://happybungalow.com/wp-content/uploads/2015/07/Happy-Bungalow-wp-logo2.png Don2013-10-02 22:02:152015-07-30 21:43:08Model 80 "Heavy Lifting Hal"
The robot toy is made up of only two pieces: the body and feet. Grooves cut into the wood set off the arms, waist, and neck. The wood, ash, is tough (think baseball bat swinging for the seats) and will stand up well to loads of play. And everything is finished with a beeswax polish we make ourselves. Fresh out of the shop: Guard Bot “200”. 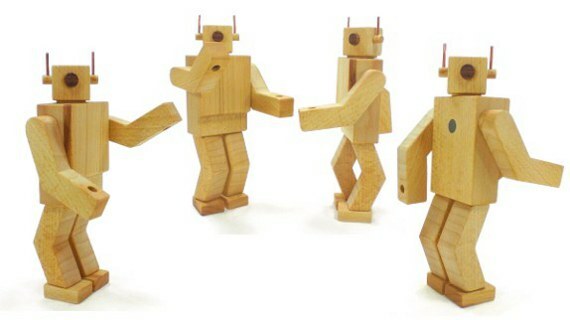 The latest robot in Happy Bungalow’s line is little kid friendly. These bots are glued together (no magnets like other Bungalow bots), but the arms and head still spin. Made of red oak and finished with a beeswax polish we make ourselves.